Persistence Market Research has recently published a new report titled “Palm Sugar Market: Global Industry Analysis (2012–2016) and Forecast (2017–2025)” that tracks the performance of the global palm sugar market for a period of eight years. To present a crystal clear picture of the market to our clients our analysts have provided detailed information about the market size, revenue forecast, drivers, restraints, trends and opportunities of all the seven regions that have been covered in this report. Apart from regional insights, we have also given comprehensive information on various market segments and sub-segments. For a better understanding of the market, we have divided the palm sugar market based on form, origin, end use, distribution channel, and region. The global palm sugar market has been experiencing significant growth; however, it is still at a growing stage compared to other products in the market. Suppliers are entering into long-term contracts with palm sugar manufacturers to avoid increase in product prices, and palm sugar suppliers/retailers are also focusing on entering into long-term contracts as it enables them to sustain in the competitive global market. The key part of this report is Persistence Market Research’s in-depth analysis and recommendations on the global palm sugar market. The report presents an overview of the global palm sugar market, comprising the market taxonomy and market introduction. This is followed by the market dynamics section, which underlines factors influencing the growth in revenue of the global palm sugar market. The analysts have also provided strategic recommendations for both existing and new players in the market to emerge sustainably profitable. Decline or increase in prices over the forecast period is based on historic market trends; any decline or increase in prices over the forecast period is kept linear across countries. The general market scenario is assumed for palm sugar sales and several factors that help boost product sales are assumed to develop the market forecast. The report also covers the competitive landscape in the global market, which provides a dashboard view of the leading companies that manufacture and provide services in the global palm sugar market. The report features company profiles of some of the key market players and a strategic overview of mergers and acquisitions along with their expansion plans across various regions. The analysts in Persistence Market Research have performed systematic and exhaustive secondary research to study the required data points to arrive at the overall market estimations. 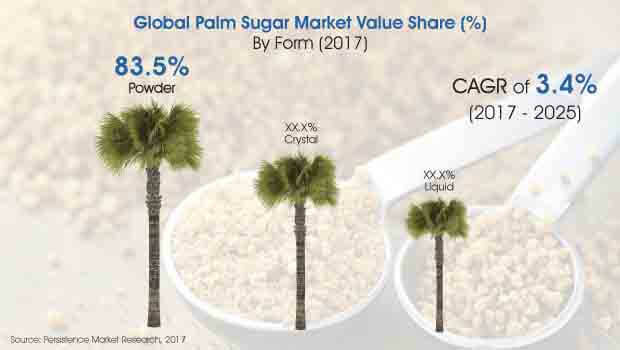 The dedicated team of analysts operating in the food and beverages domain have listed market players across the palm sugar market value chain of technology developers, manufacturers, and distributors. Comprehensive questionnaires have been developed for each node in the value chain to extract the required market information through extensive primary research. These interviews are conducted using distinguished essential resources. The data that is obtained through both primary and secondary research is validated using the triangulation method, wherein secondary and primary data points along with Persistence Market Research analysis is integrated to derive the final data. This data is then scrutinized using advanced tools to glean pertinent insights on the global palm sugar market. For a better understanding of the report, the data is represented using charts, info graphics, and presentation of key findings by region that provides actionable insights and strategic recommendations to enable key stakeholders to cement their position in the global palm sugar market. By 2025 end, the global palm sugar market is expected to reach a value of more than US$ 2,000 Mn expanding at a CAGR of 3.4% over the forecast period (2017–2025). In terms of volume, the global palm sugar market is expected to be pegged at 747,525 MT by 2017 end, and is expected to reach 958,512 MT by 2025 end, growing at a CAGR of 3.2% in terms of volume. The development of new products is the significant characteristic of this market. Companies are currently focusing on launching palm sugar in different forms, especially the liquid form, and are expected to invest more in research and development in order to expand their customer base and enhance their regional presence. In terms of value, the liquid segment by form is expected to witness fastest growth and is likely to expand at a CAGR of 4.2% throughout the projected period of eight years. The powder segment is estimated to account for a relatively high value share of 83.5% by 2017 end, and is anticipated to register a CAGR of 3.5% in terms of value over the forecast period. In terms of value, the powder segment is projected to be the most attractive form in the global palm sugar market during the forecast period. The crystal form segment is estimated to account for a value share of just under 14% by 2017 end, and is anticipated to register a CAGR of 3.0% in terms of value over the forecast period. Focus of the global food industry has shifted to natural sweeteners from artificial sweeteners. This shift can be attributed to extensive research, which suggests that synthetically manufactured food products can have adverse effects on human health. Research also indicates that palm sugar can be a better option for consumers. This is expected to boost the revenue growth of the palm sugar market. Manufacturers across the globe are focusing on innovations in food products and palm sugar is one such product under innovation to ensure enhanced nutritive value and healthier variety. Food and beverage companies are now focusing on research and development activities to augment the nutritional and multifunctional profile of palm sugar that offers good health benefits. All these factors are creating a positive impact on the global market for palm sugar. Consumers especially in the Asia Pacific region are more inclined towards palm sugar products. It is the oldest form of sweetener used in Asia Pacific countries such as Indonesia, India, and Philippines. People in these countries are aware of the health benefits associated with palm sugar. Owing to all these reasons, manufacturers and suppliers of food and beverage products are also optimizing product offerings according to consumer demand. Several food manufacturers are entering the palm sugar market in Asia Pacific, owing to the high profit margins. The aforementioned factors are predicted to fuel revenue growth of the global market for palm sugar. The global palm sugar market is primarily characterized by a large number of local and regional players. An approximate share of 70%-75% is accounted for by local players. North America and Western Europe are the two main target regions due to an increasing number of health conscious consumers and rising demand for organic and healthy food products in the market. As Indonesia is the largest producer of palm sugar, local manufacturers and regional players become the price regulators of the market. The market share held by multinational players is very low, accounting for just about 5%-10%, owing to the high prices of palm sugar.